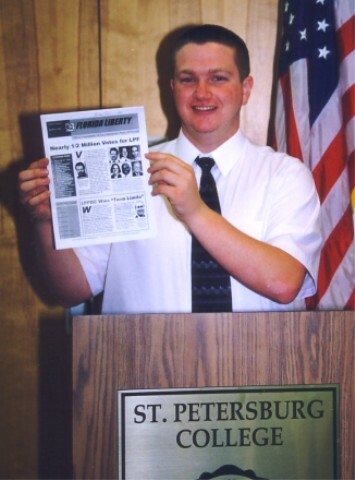 St. Petersburg College student David Enfield promotes Florida Libertarian success via Florida Liberty Newsletter to the debate attendees. St. Petersburg College student David Enfield spoke at a St. Petersburg College student political debate educating students about Libertarian ideas and providing attendees with information about the Libertarian Party. The St. Petersburg College Student Political Debate had representatives from various political parties including the Libertarian Party. Attendees were able to ask political questions and they got a wide spectrum of answers from the diverse political panel. Outreach speakers are at nearly every college and many high schools locally through the year. Contact the Pinellas Libertarians at www.PinellasLibertarians.org for a speaker.